Sicily holidays evoke images of languid days filled with Mediterranean sunshine, best enjoyed with regional wines and sublime Sicilian cuisine. And should you tire of such indulgence then there are plenty of stunning sites to explore, both geographical and historical, on a holiday to Sicily. The long wide coastal plains are edged by fine beaches and clear waters. The landscape is dotted with Greek, Arabic and Baroque treasures. There is Syracuse, Taormina, Palermo and, of course, the brooding presence of Mount Etna. Sicily, like so many Italian Islands, has long been a popular destination owing to its long summers and piquant, picturesque Mediterranean charm. You could spend an entire day wondering the streets of Syracuse and Ortigia and it would not be enough to reveal all its sites and spectacles. For ancient ruins, churches and amphitheaters, it’s by far one of the most scenic places to visit in Sicily. The ancient theatre ‘Teatro Greco’ is still used to this day and hosts the Greek Theatre Festival in late spring, one of the most notable events in the Italian cultural calendar. The Anfiteatro Romano meanwhile, retains an incredible atmosphere even though the days of violent gladiator combat are long since over. 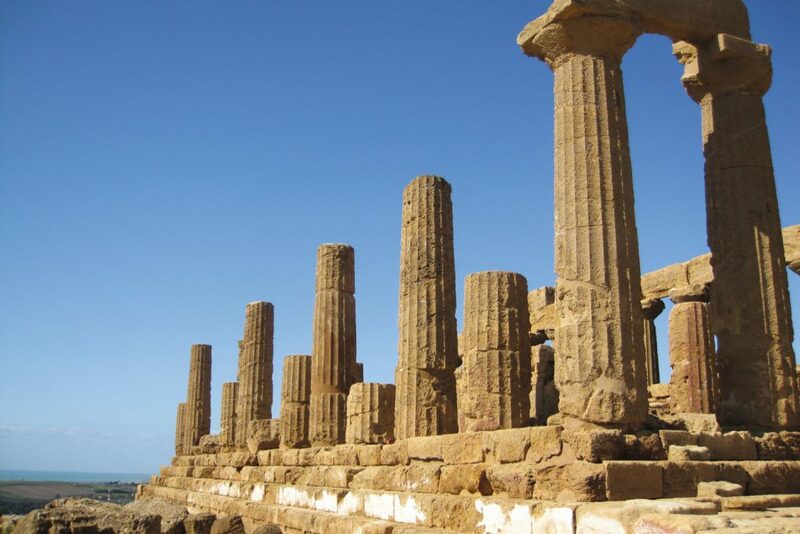 Both sites are in The Parco Archeologico Della Neapolis and are regarded as one of the top things to see in Sicily. 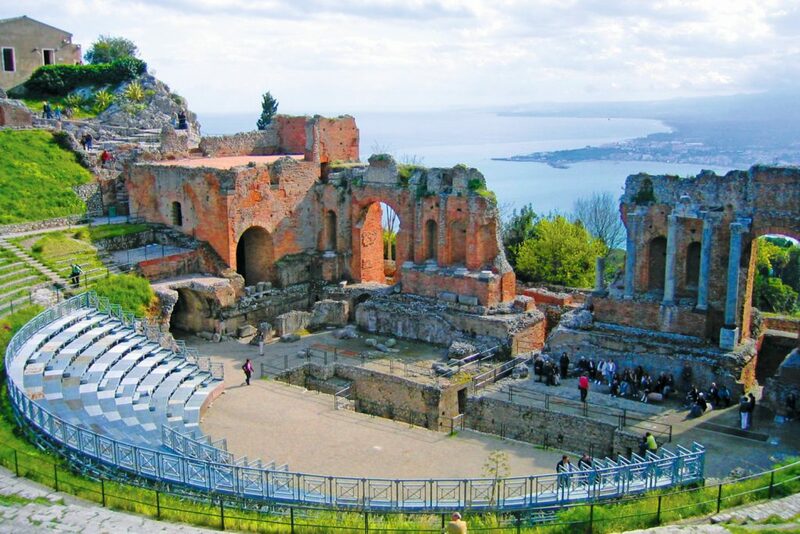 ‘Discover Syracuse’ is a 12-hour group tour leaving Taormina at 7:30am on Tuesdays, prices start from £60 per person. 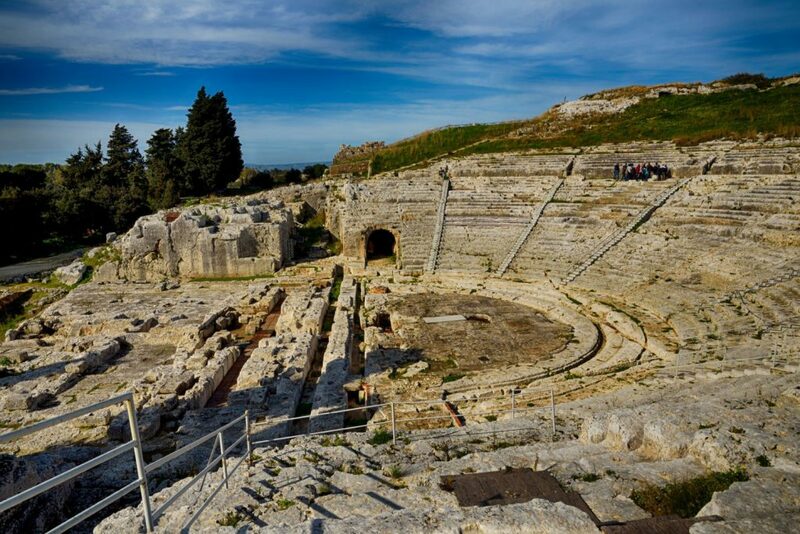 Entrance tickets to the Archaeological Park Neapolis are not included and can be purchased locally. 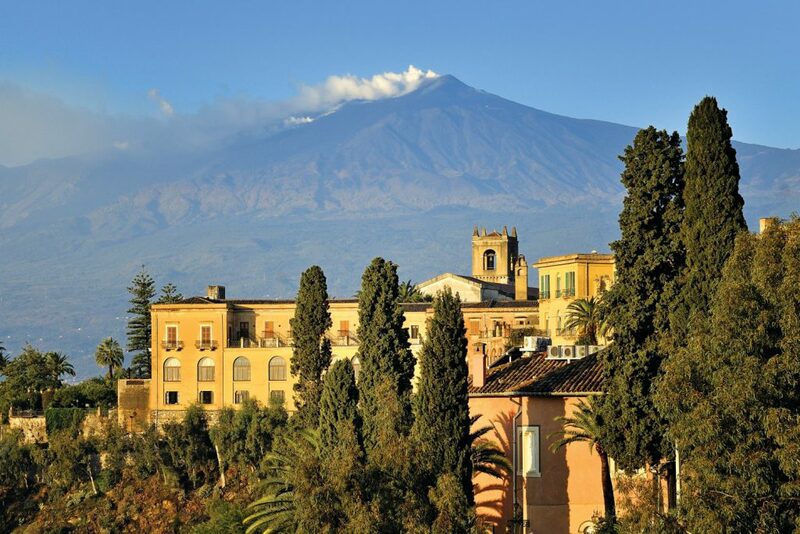 A holiday to Sicily would not be complete without a trip to see the magnificent Mount Etna. This amazing active volcano towers over the east of Sicily at an astonishing 3,350 metres above sea level. This UNESCO World Heritage Site continues to erupt a handful of times a year but this does not stop tourists visiting in their masses. This bucket list experience can be enjoyed in many ways making Mount Etna one of the finest and most memorable things to do in Sicily. Top tip: Bring a jumper as it can be chilly the higher up you go. Alcantara Gorge and Mount Etna (1900 metres) lasts just under 10 hours, this operates every Wednesday from Taormina and for an additional cost you can ascent to 2900 Metres. Prices start from £60 per person. 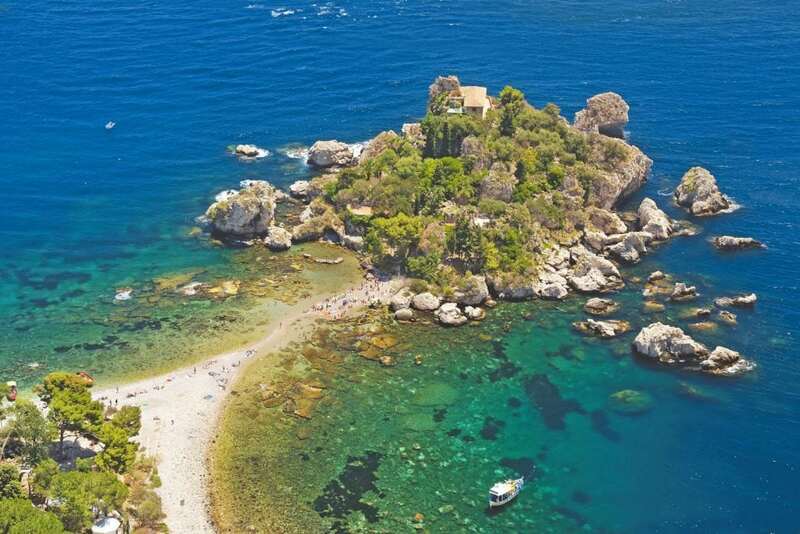 When choosing a place to stay in Sicily, you will usually be directed to Taormina as nowhere can compete with its location, views and choice of restaurants. There will be no excuse not to visit The Teatro Greco in Taormina (not to be confused with the Teatro Greco in Syracuse). Its mesmerising position with Mount Etna and the Bay of Naxos in the distance makes it a photo opportunity like no other. If you really want to feel the magical atmosphere, you can enjoy concerts and festivals throughout Sicily’s long summer season. Entrance tickets can be purchased locally at around €10. If you have a love for exploring ancient Greek archaeological sites then head to Valley of the Temples. Here you’ll find a collection of the most extraordinary and intact pieces of work left by the Greeks. Temple of Concordia and Temple of Juno Lacinia are by far the most recognisable. Due to their intact condition and towering height they rival many other archaeological sites in Italy. Naturally this is on the list of UNESCO World Heritage Sites and is regarded as one of the best things to see and do in Sicily. Ticket prices are approximately €10 per person for the Hill of the Temples and €8 per person for the Archaeological Museum. 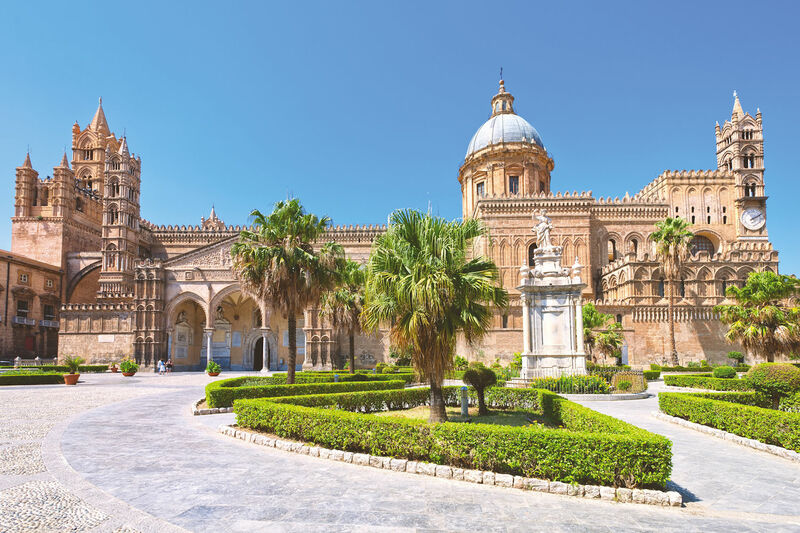 A place draped in history, Palermo has so much to offer the culture seeking tourist. It is buzzing with life and inspirations from all over the world. The small cobbled streets ooze influences from Arabia and the Byzantine Empire with an edginess to rival Napoli. Famed for its wonderful gastronomy, Palermo can make anyone fall in love with its labyrinth of narrow streets and grand buildings. 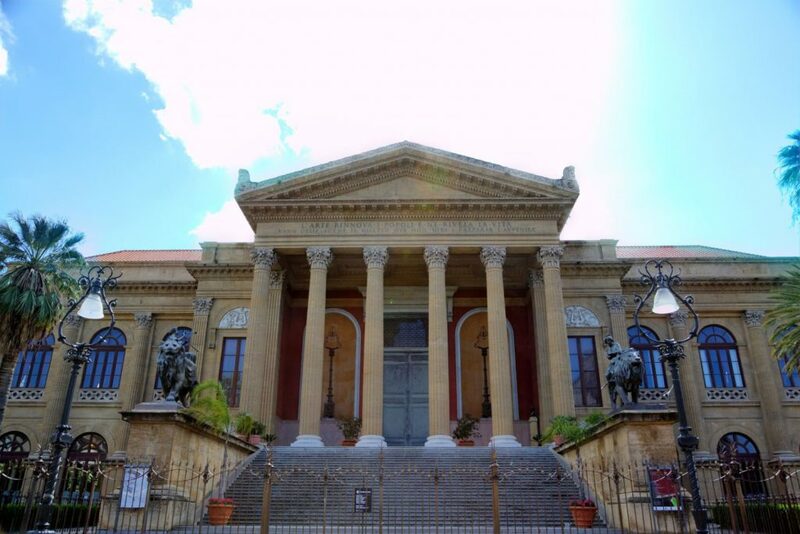 In the heart of Palermo, the Teatro Massimo is dedicated to King Victor Emmanuel II. This grand opera house is the beating heart of neoclassical Italian architecture and the largest theatre in Italy. It is a well known filming spot for The Godfather Part 3 and its grand interior is so truly spectacular, you can feel the magic as soon as you step inside. ‘Discover Palermo’ departing at 7:20am and lasting 12 hours leaves Cefalu on Tuesdays with a total price starting from £50 per person. Tours of Teatro Massimo can be booked locally from €8 per person. Going off the beaten track is wonderful if you want to do something unique in Sicily. Hiring a car and exploring inland and south of the island means you will get to see a different side to Sicily. The small picturesque fishing villages of Punta Secca and Marina di Ragusa are truly charming and a taste of authentic Sicily. Here you can eat fish fresh from the fishing boats in quaint family run restaurants dotted along the beach. 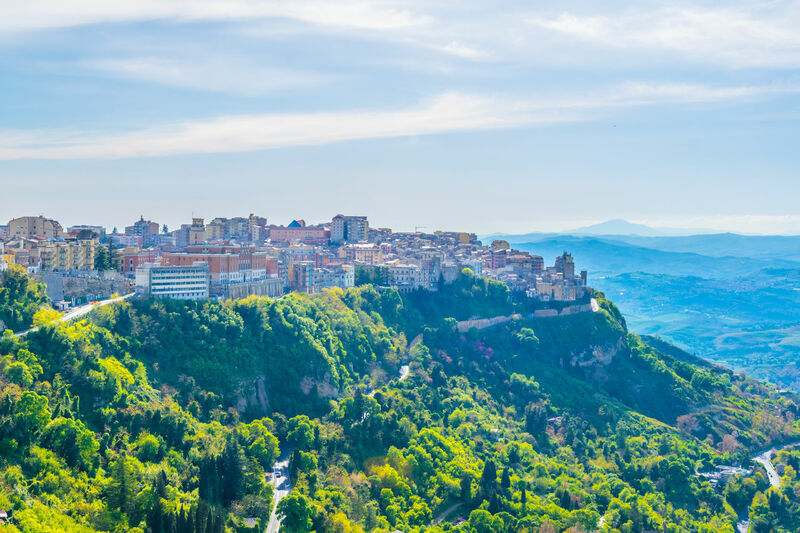 The town of Enna is also a truly unique place to see, it is beautifully perched on a hill top with breath-taking views overlooking the Dittano Valley. It is places like this you will find untouched and traditional Sicily with many points of interest. For many couples one of the most romantic and memorable things to do whilst on holiday is watch the sun set, luckily for holiday makers to Sicily you can see the sun set in one of the most wonderful places, Mount Etna. A weekly excursion will take you high up, then it is a 30-minute trek to the highest point, where you’ll see a one-of-a-kind sunset before heading back down to a mountain chalet to enjoy a typical Sicilian dinner with wine included! 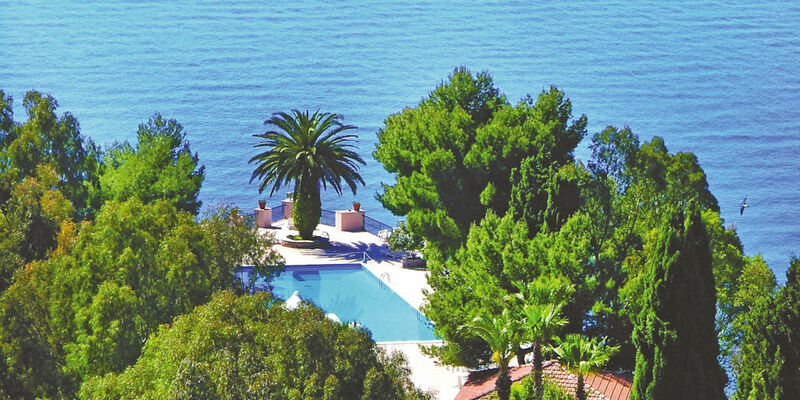 Etna Sunset Operates on a Friday from Taormina, prices from £145 per person. If you prefer to watch the sun set with a cocktail in hand then head to one of Taormina’s many bars and enjoy the wonderful views. 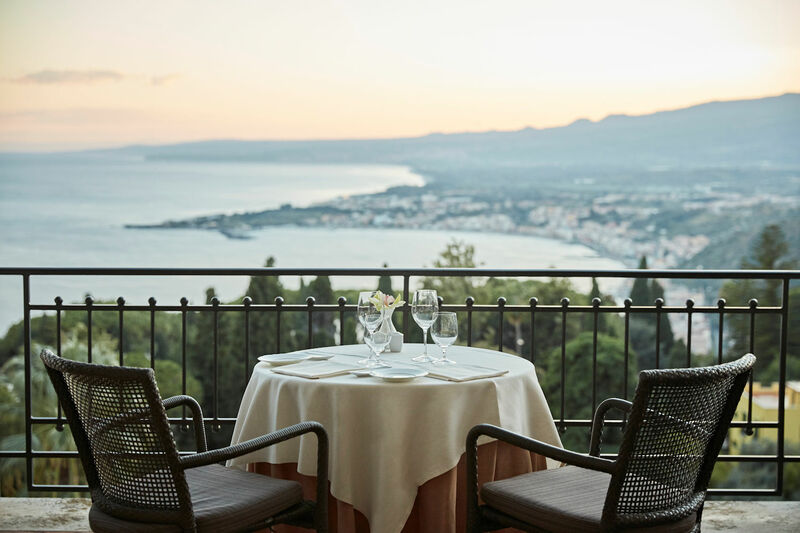 For an unforgettable evening head over to the Belmond Grand Hotel Timeo. The Literary Terrace & Bar at the hotel is known for its views of Mount Etna and the bay of Taormina as well as its superb cocktails. This is a perfect way to end a day in Sicily. When cramming in excursions, opulent dinners and shopping trips, holidays can often end up rather costly. So, you’ll be relieved to find that some things don’t cost a thing… they do say the best things in life are free. Religious festivals are very common in towns all over Sicily so if you are sticking around for a week or two there may well be some kind of ‘fiesta’ on whilst you are there. They will usually fall over a weekend and are brilliantly creative and colourful. They are to celebrate patron saints and a testimony to Sicily’s rich history. Or, if you want to admire one of Sicily’s many churches or cathedrals you will find them in towns and cities all over the island. Owing to Sicily’s rich history with influences from North Africa and Europe you will find a concoction of different architecture inside with gold mosaics, expressive art and elevated ceilings, this can be enjoyed during the day time opening hours for free. Sicily boasts one of the most beautiful coastlines in the Mediterranean with clear turquoise waters and clean beaches. There are beaches to suit everyone on the island, such as pebbled beaches great for snorkelling and long sandy beaches that are great for families. 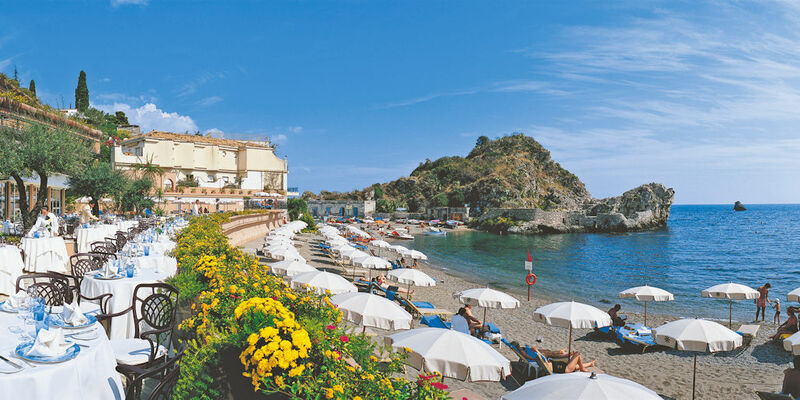 Located in Taormina Mare, also known as The Pearl of the Ionian Sea, this beach is surrounded by clear blue waters. It is a beautiful place to snorkel due to the spectacular seabed. The beach here is accessible by cable car from Taormina. Situated north of the island, is a long sandy beach with calm waters, making it a great option for families. 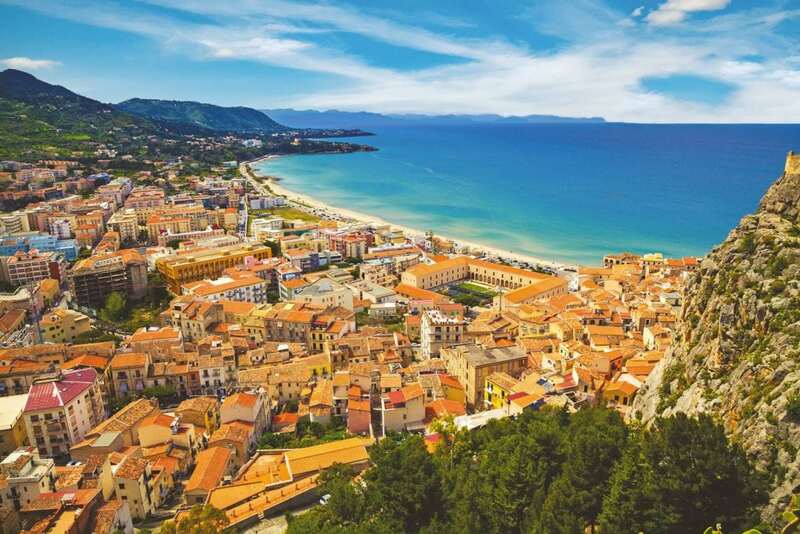 Although it does tend to get busy in the summer months, its distance from the town of Cefalu, with its restaurants and gelatorias, makes it one of the best places to visit in Sicily. Fontane Bianche is a long stretch of beach located close to the town of Syracuse. It has white sand and clear calm waters perfect for small children and swimmers of all abilities. Its name derives from the natural springs of fresh waters that flow here. Sicilian cuisine may come from humble beginnings but if you love delicious, honest and fresh food then Sicily is perfect holiday destination. The Sicilians are very passionate and proud of their cuisine and influences from North Africa, the Mediterranean and the middle east whilst remaining traditionally ‘Italian’. Sicily does not import or export much of its food so the cuisine stays true to its roots with lots of vegetables, fish, meat and almonds, with a mild climate all year round it is the perfect terrain for growing produce. 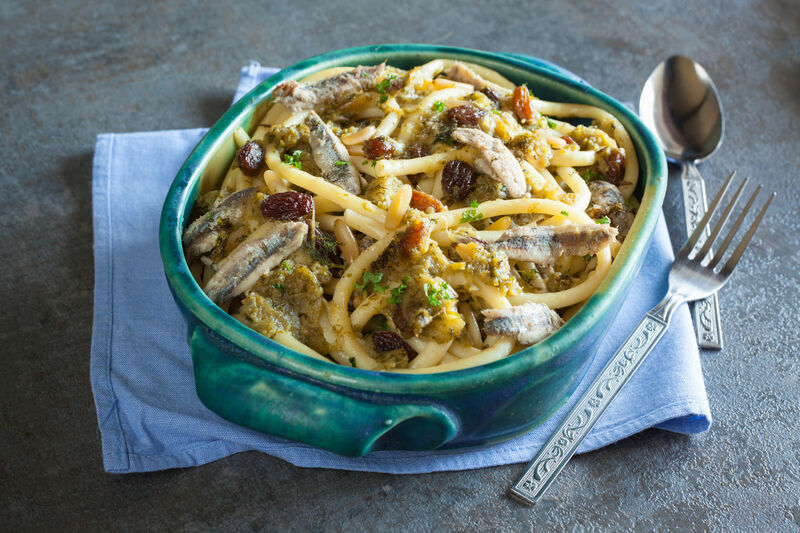 Some of Sicily’s most famous dishes include Arancini, Cannoli, Stuffed aubergine, Cassata and Pasta con le Sarde. For more delicious Italian treats read our blog the Best Traditional Italian Food: 7 Dishes You Must Try. The fertile lands are perfect for growing grapes and Sicily is becoming more known for its high-quality wine. One of the islands most well-known wines is the sweet Marsala wine from the west of the island, this is often used in cooking and is usually used to make Tiramisu. Although you may not visit Sicily for the Shopping, there is a chance you will do some whilst there. The array of markets and family run shops selling local products, antiques and hand-crafted goods means you can fill your luggage with one of a kind souvenirs and local delicacies. Palermo has a large handful of colourful and lively markets to choose from. If you enjoy haggling in a bustling bazaar inspired market then try La Vucciria in the heart of Palermo. 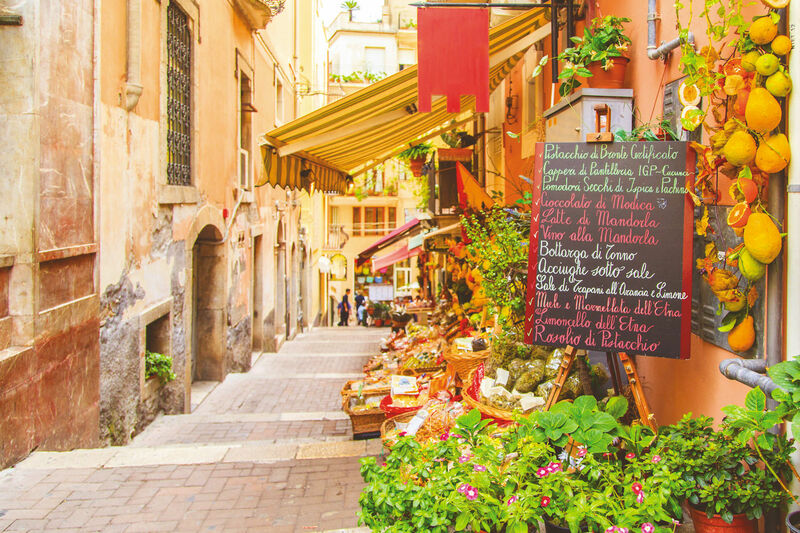 This locals’ market will make you feel at home in Sicily and is a perfect place to pick up local produce. Around the city you will also find markets selling anything from antiques to clothing; they will fall on different days so it is always best to research before going to Palermo. For upmarket boutiques and high-end Italian fashion try Taormina’s Corso Umberto. This main shopping street in the heart of the town offers the ultimate in Italian fashion. There is also plenty of cafes and bars to stop in for a coffee or an aperitif. Taormina is a wonderful place to stay and one of the best places to visit in Sicily. It has it all: shops, bars, restaurants and views! Taormina is the real hub of the island, perched on a mountain side with spectacular views overlooking the sea and Mount Etna. If you are staying in the centre of Taormina you can wander out easily and it works as a great base to explore other areas of the East Coast as many excursions leave from Taormina. Staying down on the beach or ‘Taormina Mare’ as it is known, is also a popular choice as you can relax on the beach during the warm summer days and take the cable car up to the town in the evening for dinner, a gelato and a passeggiata (Italian for gentle stroll). Dividing your time by doing a twin centre of the island such as Taormina and Syracuse or Palermo and Cefalu is a fantastic way to see more of the island whilst in Sicily. Visit our post for a guide to Italian multi centre holidays. For an exclusive holiday head over to the Aeolian Islands by ferry from Milazzo Port. Located north of the Sicilian coast, here you will find a small handful of islands offering a slow pace of life in a rugged and beautiful landscape. The Therasia Resort Sea & Spa located on Vulcano Island offers amazing views of the sea, al fresco dining and day trips by hydrofoil to the other Aeolian Islands. 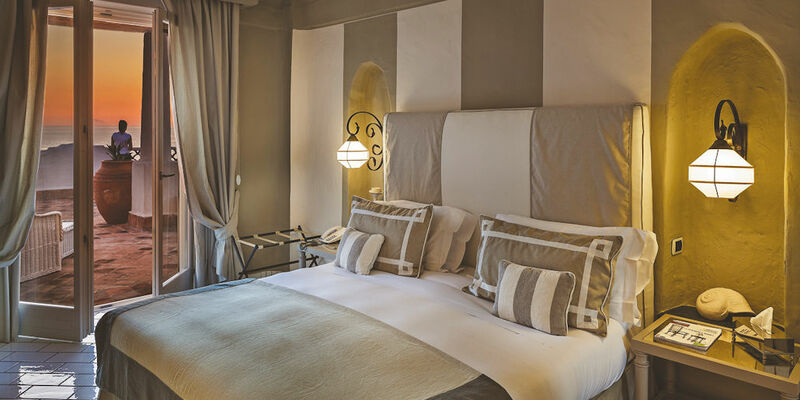 Celebrating 100 years of geniuinely warm and welcoming Sicilian hospitality, Excelsior Palace Hotel is just a few steps away from Old Town Toarmina and just 13 minutes walk from Taormina’s Teatro Greco. Situated on the beautiful beach of Taormina Mare (also known as Mazzaro Bay), VOI Hotel Mazzaro Sea Palace allows guests to enjoy the finest Sicilian cuisine and tru Italian comfort. For more information or to book any of these tours call our specialist Italy team on 0800 294 9322.